Some time over this past winter, an old college friend of mine reached out. "I love your blog," she said. "But do you ever bake anything without chocolate? I feel like that's all you seem to do." I laughed nervously and explained that since it was winter, there wasn't a whole lot of the fresh fruit that I liked to bake with easily available (ehem, like strawberries? Or rhubarb?). For some reason, her statement had embarrassed me and I reacted the way I always do in those situations — that is, I just laughed it off and self-deprecated as much as possible. Later, however, I realized that it had been silly of me to respond in the way that I did. Because it's true; I love chocolate. At the end of a long hard day's work, there's nothing more I like to do but treat myself with some chocolate — a bite of a chocolate bar, usually, or some ice cream or maybe even milk. Why do I have to excuse myself for doing so? I know that it's not a particularly exciting or unique ingredient, sure, but it's probably one of my favorite flavors and a big comfort to me. 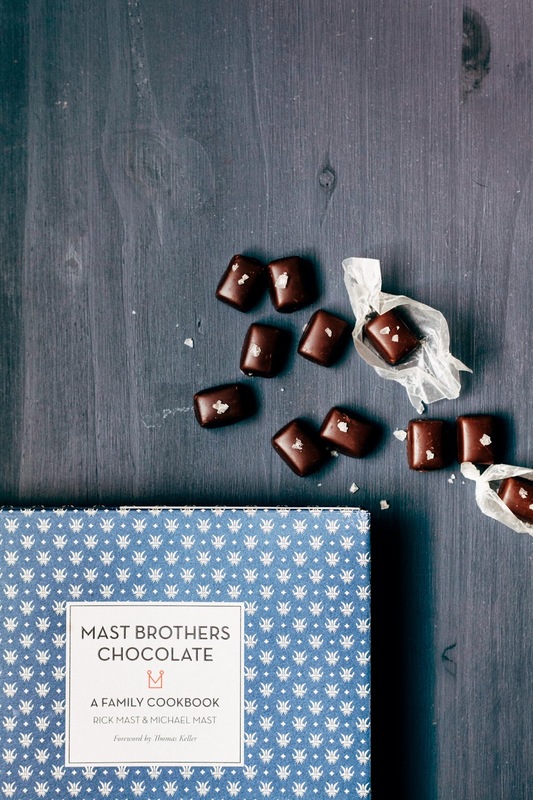 I first discovered Mast Brothers chocolate when I was last in New York City, poking around Dean and Deluca. I make a point of going shopping there every time I'm in New York, but truth be told, it's both an exciting and mildly depressing experience for me — so many fun, exciting and exotic ingredients at such exorbitant and outrageous prices! I always have to practice a lot of self-restraint, lest I walk out of the store paying $500 for five items. 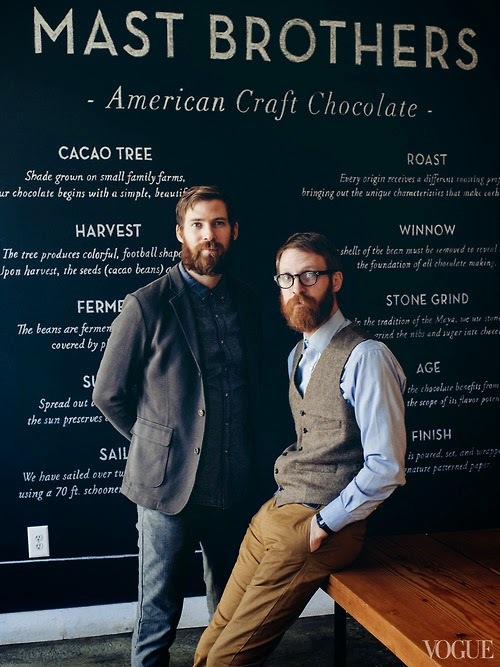 Six years later, the Mast brothers have graduated from selling their chocolate from local farmer's markets to places like Dean and Deluca, from their kitchen to their own chocolate factory (complete with a tasting room!) 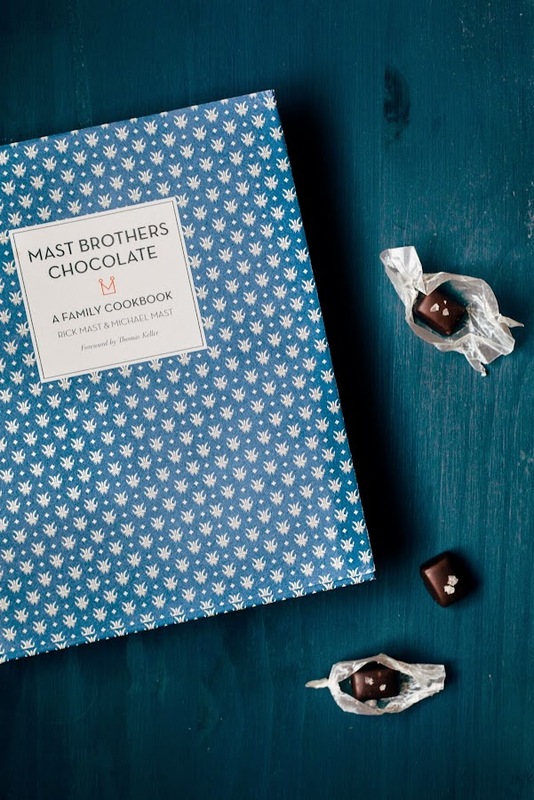 in Brooklyn, and published Mast Brothers Chocolate: A Family Cookbook. The cookbook features a wide range of recipes, from drinks (like chocolate soda!) to baked goods (like these brown butter, chocolate, maple and pecan cookies) to dinners (like orange cocoa nib crusted salmon), all with chocolate as its main star. The recipes are simple yet elegant, often times with only a handful of ingredients and never exceeding more than a page for their instructions. In the past, I'd always been intimidated by making candy, but Mast Brothers' recipe boiled it down to just seven relatively easy steps. The result was a luscious and perfectly chewy caramel paired with deep and bold dark chocolate. Follow me (@hummingbirdhigh) in Twitter. Following me on Twitter gives you 10 entries in the raffle, increasing your chances of winning! The good news is, if you already follow me on Twitter, you automatically earn the 20 entries without having to do anything. yay! Tweet about the giveaway. Tweeting about the giveaway gives you 10 entries in the raffle; just be sure to tweet at me (@hummingbirdhigh) using the giveaway widget so I can keep track of the entries. Do both to earn 20 entries. Following and tweeting at me earns you the highest number of entries, increasing your chances of winning the cookbook! Unfortunately, the giveaway is for US residents only. The giveaway lasts for one week and ends next Wednesday on 06/04/2014 at 7:00AM EST. Come back next week to see if you've won! The giveaway is now closed. Thanks for participating! Congrats to Rachel M!!!! I'll be emailing you shortly to get your mailing address for the book. I'm not usually a sucker for specialized tools, but to succeed at making candy, it's really important to have a good candy thermometer on hand. I also prefer digital candy thermometers like this one by CDN since I find that they give you the most accurate readings and are often times instant-read. Let's talk about tempering chocolate. It's a common step in many chocolate candy recipes, one that sounds intimidating as all hell but is actually... not. Tempering is the process of heating and cooling chocolate to the right temperature for a stable crystallization of cocoa butter. Tempered chocolate has a glossy shine with an appealing "hard snap" when bitten, whereas untempered chocolate has a weird, white powdery surface (called "bloom"). For the recipe below, I include instructions for tempering chocolate using The Seeding Method, which involves placing solid, tempered chocolate into a bowl of melted chocolate. As the solid chocolate melts, its orderly cocoa butter crystals encourage the cocoa butter in the rest of the melted chocolate to reform in the same way — shiny and snappish. For tempering to work, it's important to use a good, high-quality chocolate bar and not chocolate chips. Chocolate chips are designed to hold their shape in high temperatures and has a different crystal structure from bar chocolate. I'm serious. Food engineering is crazy. Generously butter an 8-inch square pan. In a medium, heavy-bottomed saucepan, combine 1 1/4 cups heavy cream and 2 cups unsalted butter. Heat over medium heat until melted. Set aside. In a separate, heavy-bottomed saucepan over medium heat, melt 2 cups granulated sugar. Use a candy thermometer to monitor the temperature constantly until the sugar reaches 300 (F). When the sugar reaches 300 (F), ladle a small amount of the cream and butter mixture (from the 2nd step) to the caramelized sugar. It will boil and sputter violently, but this is normal. Continue ladling the cream and butter mixture into the sugar until completely combined; heat the mixture to 260 (F), before adding 5 ounces finely chopped dark chocolate, using a heatproof rubber spatula to stir the mixture until it is a uniform golden-brown color. Pour the mixture into the prepared 8-inch square pan and allow to cool completely on a wire rack. When the caramel has cooled completely, slice the caramels into square or rectangular shapes. Transfer the caramels to a sheet of wax paper. Prepare a wire rack by placing over a baking sheet (this will catch any excess chocolate and salt that fall off the caramels). Set aside about one-third of the 8 ounces of finely chopped chocolate. Place the remaining two-thirds of chocolate in a double boiler, or a heatproof glass or metal bowl set over a saucepan full of simmering water (if doing the latter, make sue the bottom of the bowl does not touch the water). Allow the chocolate to melt, stirring occasionally and monitoring the temperature with a candy thermometer. When the chocolate has fully melted and reached just above 105 (F), remove the pot (or bowl) from heat. Dry the bottom of the pot (or bowl) with a dish towel, before stirring in the reserved chocolate (from the 2nd step). Stir until the chocolate temperature drops between 88 - 90 (F). Carefully remove any unmelted pieces of chocolate and set aside. Test the temper by smearing a small amount of chocolate on wax paper, and allowing it to cool at room temperature for about 10 minutes. The chocolate should feel dry, with a smooth, streak-free and shiny finish. If the chocolate appears dull or streaky, you can melt the chocolate and repeat the tempering process. If satisfied with the chocolate, work quickly and place an individual caramel on a fork. Dip the caramel into the bowl of tempered chocolate until completely submerged, before transferring to the prepared wire rack. Sprinkle with sea salt. 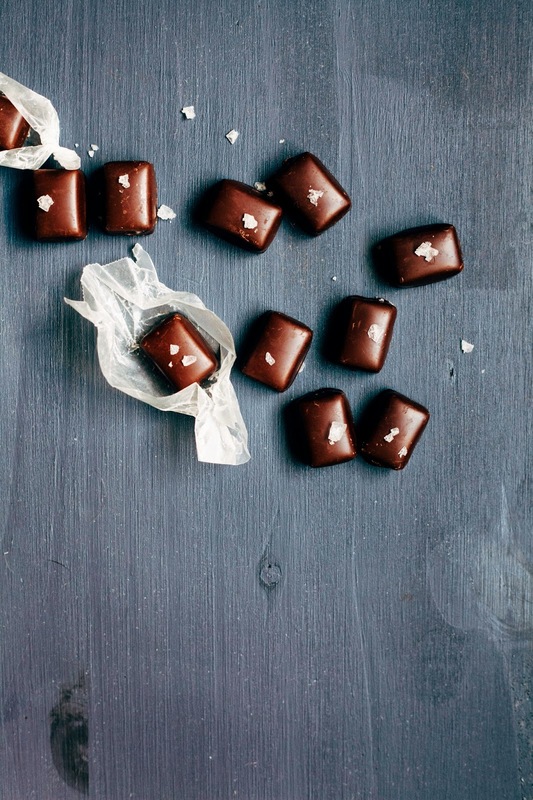 Repeat until all caramels have been covered in chocolate, and allow the caramels to cool completely. The chocolate caramels look soooo good! Really, how can you go wrong with chocolate and caramel? Last year I learned how to temper chocolate using my food processor! You don't need a thermometer but it does take a little bit of time. i saw some of their bars in a local coffee shop the other day and then - bam - here you are featuring their book! i think it's a sign! beautiful, beautiful candies - keep the chocolate posts coming! these might be my favorite photos you have done. bravo lady! Do not ever feel guilty about loving chocolate. It is the best!! I love the way you photographed these chocolates, they look as precious as gold and silver! Nice photos and that chocolate looks divine! I would be really suspicious of people who DON'T like chocolate! I mean, it's CHOCOLATE! 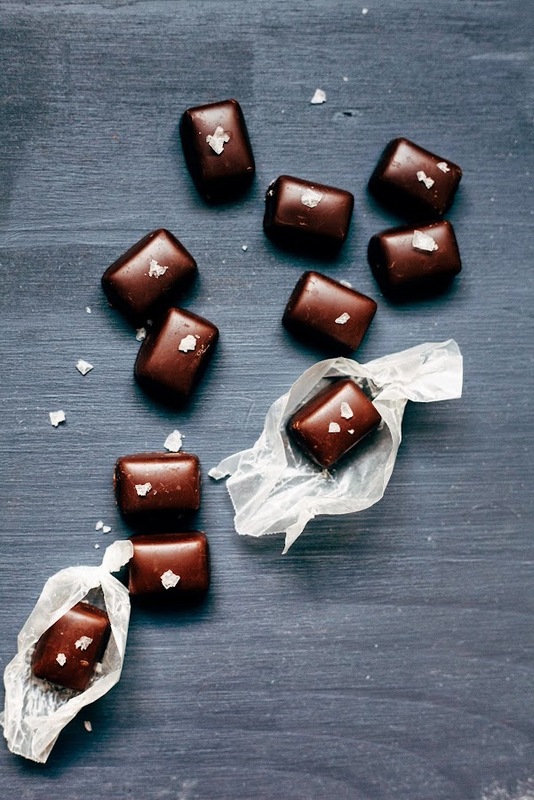 It's the warm blanket on a cold night and a soft pillow when you need something comforting These double chocolate caramels look divine!!!!!!!!!!!!!!!!! Oooh they look just lovely, melt-in-your-mouth type candies! Yum! so beautiful. so so so SO beautiful. that book is lovely. my fiancee and i are really into bean to bar and are launching our bean to bar chocolate co this year!!! so excited. ima have to make these, of course. you're styling and photos RULE. Such a fan of these guys! My husband and I were lucky to get a copy for one of our anniversaries. Chocolate all day, everyday! Gorgeous. I love mast brothers chocolate. My bars of choice! These caramels are just beautiful. Thank you for sharing! .....and now I am drooling. 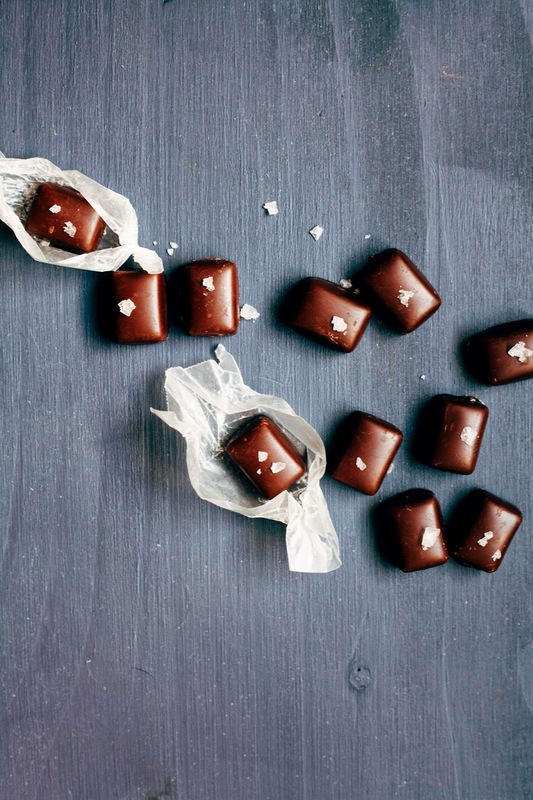 Sea salt should always go with chocolate. LOVE the Mast Brothers Cookbook. Well done, girl! I tried making these this morning, but I think I made a mistake somewhere! The caramel was coming along fine until I added the chocolate and then it became a thick mess with liquid (oil?) settling on the top. It would not blend back together. I think it could be because I used 64% dark chocolate instead of 70% as it was all I had at the time. Any advice for my next attempt? Sorry to hear that it turned out to be a mess! I'm no chocolate expert, but I think the % of cocoa in the bar actually matters in this recipe. Also, be sure to chop up the chocolate as finely as you can, so that the two mixtures will have an easier time emulsifying.